WILLIAMSBURG, VA -- As detailed in the first of this two-part series on Curtis Strange, he's probably best known for captaining the US Ryder Cup team last September -- which only slightly overshadows the notoriety of his considerable accomplishments on the PGA Tour, and his work as lead analyst for ABC's golf coverage. What's probably not as widely known outside the Mid-Atlantic region is Strange's work in golf course design. Though he insists he's 'only' a consultant, there's little doubt he's got some learned opinions on what goes into creating a good golf course, and he's had the opportunity to work with such notable course designers as Pete Dye and Tom Clark along the way. Who else better to assess what's doable in the game of golf than a player who's won twenty-one times worldwide, and seen just about every course worth mentioning? Strange also humbly admits that he no longer competes, at least in a power sense, with the younger players on the professional circuit, and he's also got some rather strong views on the advancements in equipment technology and how it's changing golf -- in course design, as well as in professional tournament course set-ups. Strange is looking to the future, with the Champions Tour a couple years away, as well as his continuing involvement in television commentating. Even after completing his tenure as Ryder Cup Captain, there are still more than enough demands on his time to keep him busy. For now, however, he's looking forward to finishing up the rehab work on his elbow and returning to the PGA Tour to play some golf. Q: Having played several of the golf courses you've consulted on, I've found them all playable, scenic and well thought out. Are there any general philosophies you like to incorporate into your course designs? Strange: First, I'm always a consultant on the design. I'm not a designer, and would never try to think of myself as such. I wouldn't want to insult or embarrass the true professionals in the business. It's hard for me to articulate a general 'philosophy,' because I've done something like twelve projects now, and I'd have to look back on 'em to see what the common traits are. Someone like Tom Clark, who I've worked with 3 or 4 times might have a better answer for that question. All I know is -- the game is changing so quickly now, for professional players. It's not changing as drastically for the average player, so it's tough to combine those elements into a satisfying course design for both groups. But I think it can be done. Q: From a design consultant's standpoint, then, what are the types of things you like to see in the courses you work on? Strange: Number one, playability. Personally, I thought some of the courses went over the top in difficulty back in the eighties -- especially with the playability around the greens. I don't like the 'manufactured' look in a golf layout. I prefer 'old style' golf courses, where they flow with the lay of the land. I like to move as little dirt as possible at each site -- to let the flow of the land dictate what you do. I know that's difficult on a lot of projects, but for those who do it, do it well. And those who don't, don't. Q: Tom Clark said of your collaboration on the Woods Course at Kingsmill -- that there were some trees that you thought should be taken out, and he wanted to keep them in the design. So he started calling them 'Curtis's trees.' Is that a good example of the give-and-take of consulting work? Strange: (Laughs). Sure. And you know, in the long run, he was right. I'm usually against taking out trees, because you can always take 'em out later on. But he was definitely right in that case. That's part of learning the business, and working with the architect. I don't think you're right or wrong in either scenario like that, but as a consultant, you try to add to each hole, and add something possibly a little different that maybe the architect hadn't thought of. Q: What do you think is the key element to a successful course design? Strange: You know, aesthetics to me are so important, because you've got to remember that people still have to enjoy playing this piece of property, long after the course is finished. I think you can take a very average golf course, but if it's pretty and well conditioned, it's enjoyable. I still enjoy some of the old, old country clubs that are 6,400 yards, because they have that quality. At the same time, you can take the grandest course, whatever that might be in this world, and, if it's in ratty shape, or not pretty to look at, I'm not going to enjoy it that much. There are some examples like that, but I'm not going to give 'em to you. Strange: It wouldn't be fair to do that. Q: Okay. Is course consulting something you're looking to get into more in the future? Strange: Not really. I thoroughly enjoy what I do, simply because I'm extremely busy with TV and still playing some. And I'm just two short years removed from the Champions Tour. I enjoyed consulting on the golf course designs that I've done, but I just didn't ever have time to really do more of it, and won't have time to get deeper into it. I also think the time has passed to pursue that type of thing, because the economy is not good, and a lot of golf courses have slowed down. That means construction is going to slow down, because there are a lot of golf courses out there going broke. So it's not the right time, even if I so desired to get more into it. Q: Obviously, you've played all around the world... what do you think of golf in the Mid-Atlantic region as it compares to some of the other major golf regions of the world? Strange: Gosh, it holds its own. I think it certainly holds its own. We have some wonderful old, old golf courses, and we have a good history here. We've had a number of good players to add to that history. Again, a lot of your history of golf courses is dictated by the lay of the land you have. So, up in the northeast, we hear about the old, grand style of golf courses, and we hear about the beauty out on the west coast with the courses on the ocean. The Mid-Atlantic has its own characteristics that are just as attractive in their own right. Q: But now we have only one regular PGA stop, the Kemper Open, at least in the DC area. Do you see the Tour taking some more interest in the region in the future? Strange: I don't know. We already have an extremely full schedule -- and Tim Finchem (PGA Tour Commissioner) has fought that issue in the last year, because of the economy, but also because of our aggressiveness as well. The economy could've held up golf if we didn't demand so much of these sponsors now. So there's a two-fold reason as to why we're looking to add some sponsors. We've certainly got some good potential tournament sites in the Mid-Atlantic. Take Baltimore for example -- it's certainly big enough, and golf oriented. But have we ever gone there? I know the seniors had their open out at Dennis Satyshur's place, Caves Valley. But other than that, I can't think of a PGA Tour event ever going there. We had a couple US Opens at Congressional and the President's Cup at Robert Trent Jones Golf Club, but we certainly could use some more venues with that type of classic reputation in order to attract more events. Q: Do you see playing a pretty full schedule on Champions Tour when the time comes? Strange: No, at least not a full schedule. Kind of a 'semi' schedule, I guess. I have to make a decision in the next year and a half on how to combine the TV work with my playing schedule. The choices being 'do I cut back on the TV?' or 'do I not take the Champions Tour as serious as some?' I currently have the 19-week job with ABC, and I have to first of all decide how many weeks I want to be on the road again. I'm trying to get healthy right now, and we'll go from there. At this time, I kind of want to play. Q: Speaking of playing, at Brickshire's Grand Opening last March, you talked a little bit about the upcoming Masters and the changes they'd made to Augusta National. You said you were glad you weren't playing in the tournament, because some of the holes were now so long that you felt it eliminated most of the field. Can you expand on that? Strange: Sure. It doesn't take a real smart man to figure out that some of these courses give a huge advantage to the guys who really bomb it. At the same time, I think there're other ways to make the golf courses more difficult, other than just adding yards. Right off the top, you eliminate a lot of good players, just because they aren't as long off the tee. I don't know... I guess history has always fought the 'length factor.' Now, there's such a disparity between the good, short hitter who is a world-class player, like Justin Leonard -- he's not short, he's average -- and the Tiger Woods/John Daly players. Phil Mickelson, Ernie Els, that group of guys. You can't give up 30-40 yards off the tee every time and expect to beat them. I just think at Augusta, they do what they want, obviously. Q: Has it gotten too ridiculous? Strange: Well... no. I think what was ridiculous was last year's US Open, when you can't even reach the fairway at Bethpage. That was ridiculous. If you give these guys an avenue, they can play. But you've got to give 'em a chance to compete. And when Tom Meeks (Senior Director of Rules & Competitions for the USGA), who is a good friend of mine, said 'we don't change the setup of the course because of weather,' that's ridiculous. Weather conditions have to dictate some things, and especially when you start a fairway out at whatever it was, 250 yards for a US Open, or something like that. Q: Weather really seems to have had a big impact on majors recently -- certainly last year at the British Open as well as the US Open. A few years ago at the Masters, when Vijay Singh won, the weather basically wiped away everyone who played in the afternoon on Saturday (except Singh), which also gave the guys who played in the morning a great chance to get back in the tournament. Any thoughts on that? Strange: That happens, it's just the luck of the draw. Q: Was Sergio Garcia correct at last year's US Open when he said if Tiger Woods had been out on the course during the monsoon on Friday afternoon, that they would've stopped play? Strange: I don't think that's accurate at all. I wasn't there, but the last thing the organization (USGA) is thinking about is who's out on the golf course and who's not. They have more important things to worry about than who's out there. I think Sergio showed some immaturity by saying something like that. Q: Well, he's known to drop some 'bombs' like that from time to time. Strange: That's right, and we know that, so we take that kind of stuff with a grain of salt. Weather's almost always a factor at the British Open, every year. The luck of the draw dictates so much on who's going to play well. The players know it, so there's no need to question the motives of the tournament officials. If a course is already set up, and weather moves in, then obviously you can't do anything about it. But, when you know the weather's going to move in, I think you can make allowances for that. I don't like the carry shots -- I don't care if it's membership play, or the US Open. You have to take things like that into account. And they knew they had a potential problem (speaking again of the 2002 US Open). You've got to give the guys a chance to get to the fairway. You had players hitting good, straight drives that were landing in the rough, because they simply couldn't fly it to the fairway in that downpour. Q: Certainly the winner didn't have that problem. When thinking about Tiger Woods' impact on the game -- as far as bringing new people to the game -- do you think that's going to have staying power? Strange: Absolutely. When you are arguably the most recognizable athlete in the world -- and we have him in golf -- I think that is staying power. When you compare him to Michael Jordan, or Ali, or Pele, who to me, were the number one athletes in the world in their times... well, he's in their class, and they all had staying power. And I think they had staying power long after they left their sports. Q: You can tell it just from Woods' marketing power. It's phenomenal what he's done as far as making Nike a player in equipment manufacturing in such a short time. Strange: Certainly there've been a number of players over the years that 'push products,' and can move the television ratings -- and bring people out to the golf course. Only a true superstar can do that, and Tiger Woods does it more than anybody else ever did. John Daly did a lot of that, too, a few years back. Strange: Yes. They won't admit it, but it is. Again, it's just being realistic, and there's nothing we can do about it, as far as the Tour itself -- because it was somewhat like that with Nicklaus, and on a smaller scale, Greg Norman. But that's just the way it is. When you have a true superstar like Tiger, there are tournaments that will get him, and tournaments that won't. Unfortunately, it'll make a huge difference in your TV ratings, but most of the tournaments still sell out as far as attendance goes. Think of it like this. You've got a sponsor, say Michelob, and you're going to charge Michelob the same thing on Tour that you're charging Dallas, and Dallas gets him to play. That's a tough situation, because say Coors Light sponsors the Dallas tournament -- Coors Light's going to get a 4.2 TV rating, and Michelob's going to get a 1.9. It's a big difference as far as the marketing power for the sponsors -- but again, there's nothing you can do about it. The Tour's always had a 'star,' but never quite like this. And you know, we're damn lucky we have him, but it causes some problems as well. Q: What do you think of the equipment advances, and how they're changing the game? Strange: Well, I think the equipment has certainly gotten better, but there's a whole influx of factors that are changing the game. The players are more athletic -- bigger, stronger, jump higher, the whole bit. And the golf courses are so much better than they ever have been, which means the fairways are cut tighter and the ball rolls farther. It all combines for long, long drives. But I would say the equipment is the biggest factor -- especially the golf balls and the drivers. It's just technology, and where do you stop that? As long as it's within the limits of USGA, which everything has been, you can't really complain. Q: Didn't the USGA try to 'stop' technology at a COR of .830? Strange: Well, they had to in a way. They've always had these limits -- and if you don't have them, you'll start seeing a 'super ball' out there. I mean, a true 'super ball' -- and I don't think anybody wants to see that, because we want to continue to play all the old, great golf courses that can't stretch out to 7400 yards. Q: The talk certainly started again after Ernie Els blew away the field at the Mercedes Championship this year. Strange: Ernie is very good. I mean, he lapped the field, and you'll see a performance like that once in a while. You look at Tiger Woods, in still the damndest, greatest performance in the history of golf as far as I'm concerned at Pebble Beach, at the 2000 US Open. By far. You can throw Hogan, Nelson, -- all of 'em out the window, compared to that. But as far as Els goes... first of all, there wasn't any wind at the Plantation Course (in Hawaii, site of the Mercedes Championships), and they need wind there to toughen that course up. The other thing -- Ernie knocked it down to the bottom of the hill on fifteen two or three of the four days there (which equates to about a 400 yard drive, downhill). He hit an eight iron into the green, and I can't get home there in two, barely -- maybe with two woods. It's phenomenal how far these guys are hitting it now. Q: It certainly makes for good marketing for Ernie's new equipment company, Titleist. Strange: They're certainly proud of his accomplishments. I'll tell you -- I've been with Titleist for eight years now, and their equipment is incredible. I don't say it just because I'm with 'em, either. There are a number of manufacturers with good drivers -- but with their ball technology, and their irons look so good now. Q: What are you playing now? Strange: I'm actually playing perimeter weighted forged irons, which I've always thought was the way to go. Titleist made these things, and they're wonderful, with a soft feel, and the forgiving effect, a little bit. Taylor Made's also making some good stuff, some beautiful irons. Q: If that's true, he certainly hasn't grown up in the grand traditions of the game! Strange: That's right! (laughs). "You know, we'll see just how good you are, son -- take that old butter knife two-iron and see if you can hit it!" 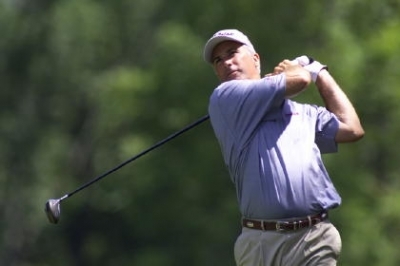 Curtis Strange says he's always fought his swing, but here, it's hard to notice anything but perfect form. Photo By Larry Lambrecht. Somehow, it probably wouldn't have mattered much if Strange had played that old butter knife two-iron throughout his career, because he would've found a way to make it work. His work ethic in his developing years is legendary, and his passion for the game is unquestioned. And though Strange is in what would be considered the twilight of his PGA Tour playing career, it's equally obvious his fire still burns for golf, in many different avenues. He says golf is fortunate to have Tiger Woods -- but we here in the Mid-Atlantic, are fortunate to have Curtis Strange. And for a broader sampling of Larry Lambrecht's work, see his website at www.golfstock.net.